The underlying architecture in Haswell-E is not anything new. Haswell desktop processors were first released in July 2013 to replace Ivy Bridge, and at the time we stated an expected 3-17% increase, especially in floating point heavy benchmarks. Users moving from Sandy Bridge should expect a ~20% increase all around, with Nehalem users in the 40% range. Due to the extreme systems only needing more cores, we could assume that the suggested recommendations for Haswell-E over IVB-E and the others were similar but we tested afresh for this review in order to test those assumptions. For our test, we took our previous CPU review samples from as far back as Nehalem. 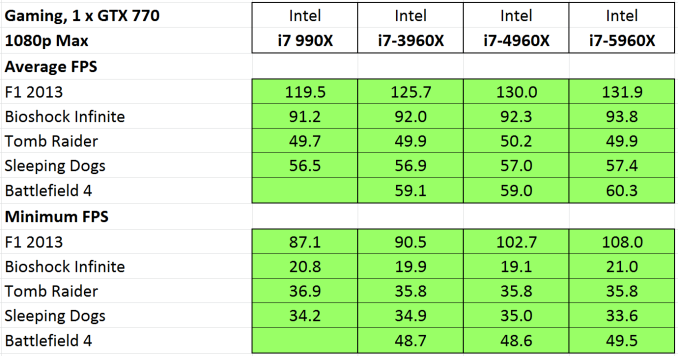 This means the i7-990X, i7-3960X, i7-4960X and the Haswell-E i7-5960X. Each of the processors were set to 3.2 GHz on all the cores, and set to four cores without HyperThreading enabled. Memory was set to the CPU supported frequency at JEDEC settings, meaning that if there should Intel have significantly adjusted the performance between the memory controllers of these platforms, this would show as well. For detailed explanations of these tests, refer to our main results section in this review. Average results show an average 17% jump from Nehalem to SNB-E, 7% for SNB-E to IVB-E, and a final 6% from IVB-E to Haswell-E. This makes for a 31% (rounded) overall stretch in three generations. Web benchmarks have to struggle with the domain and HTML 5 offers some way to help use as many cores in the system as possible. The biggest jump was in SunSpider, although overall there is a 34% jump from Nehalem to Haswell-E here. This is split by 14% Nehalem to SNB-E, 6% SNB-E to IVB-E and 12% from IVB-E to Haswell-E.
Purchasing managers often look to the PCMark and SYSmark data to clarify decisions and the important number here is that Haswell-E took a 7% average jump in scores over Ivy Bridge-E. This translates to a 24% jump since Nehalem. Some of the more common synthetic benchmarks in multithreaded mode showed an average 8% jump from Ivy Bridge-E, with a 29% jump overall. 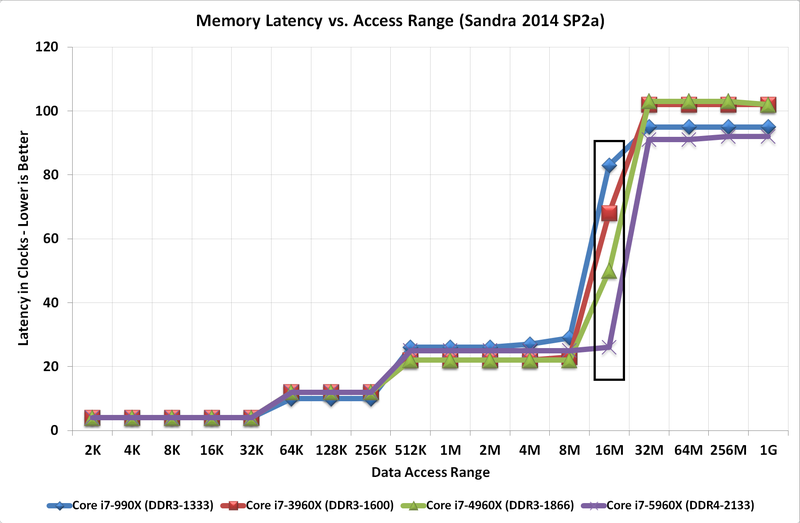 Nehalem to Sandy Bridge-E was a bigger single jump, giving 14% average. 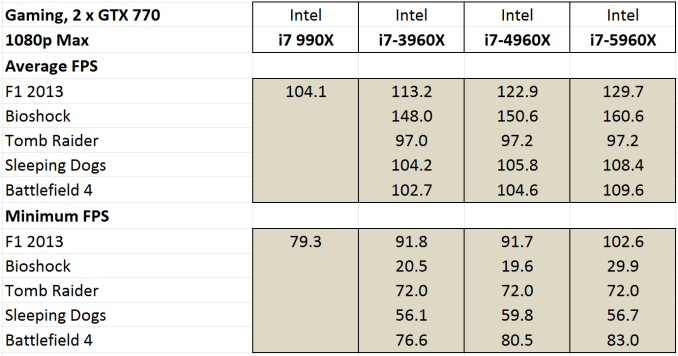 In the single threaded tests, a smaller overall 23% improvement was seen from the i7-990X, with 6% in this final generation. Haswell-E has an 8% improvement in performance over Ivy Bridge-E clock for clock for pure CPU based workloads. This also means an overall 13% jump from Sandy Bridge-E to Haswell-E.
From Nehalem, we have a total 28% raise in clock-for-clock performance. The only title that gets much improvement is F1 2013 which uses the EGO engine and is most amenable to better hardware under the hood. The rise in minimum frame rates is quite impressive. All of our titles except Tomb Raider get at least a small improvement in our clock-for-clock testing with this time Bioshock also getting in on the action in both average and minimum frame rates. 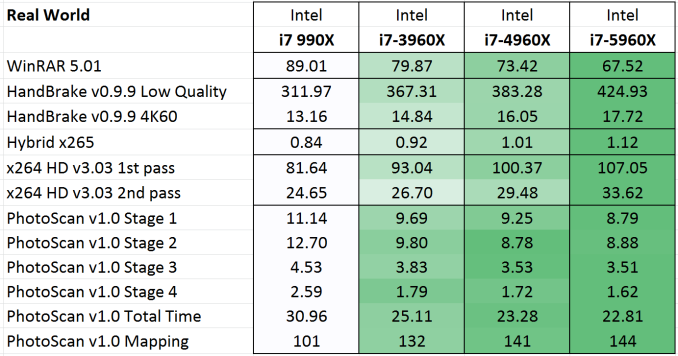 If we were to go on clock-for-clock testing alone, these numbers do not particularly show a benefit from upgrading from a Sandy Bridge system, except in F1 2013. However our numbers later in the review for stock and overclocked speeds might change that. Haswell is a tock, meaning the second crack at 22nm. Anand went for a deep dive into the details previously, but in brief Haswell bought better branch prediction, two new execution ports and increased buffers to feed an increased parallel set of execution resources. Haswell adds support for AVX2 which includes an FMA operation to increase floating point performance. As a result, Intel doubled the L1 cache bandwidth. While TSX was part of the instruction set as well, this has since been disabled due to a fundamental silicon flaw and will not be fixed in this generation. The increase in L3 cache sizes for the highest CPU comes from an increased core count, extending the lower latency portion of the L3 to larger data accesses. The move to DDR4 2133 C15 would seem to have latency benefits over previous DDR3-1866 and DDR3-1600 implementations as well.